If you prefer your cake with fresh cream instead of the icing just let us know and we will make it for you. 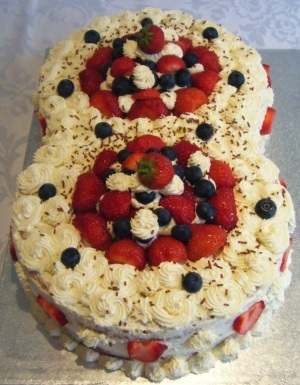 Fresh cream cakes with fresh fruit such as strawberries, raspberries and blueberries are very popular but there is no limit to the variety of fruit you can choose. We have made them with mango, kiwi, pineapple and cherries and you can have strawberries dipped in delicious chocolate. The prices will vary depending on the type of fruit and quantity of fruit. Fresh cream cakes need to be kept in a fridge and eaten on the day of collection.